Happy Wonder Wednesday 74! Do you find that the transition seasons (fall and spring) are chock full with outdoor events and entertainment? I sure do, only I’m usually hosting them rather than participating! I’ve met up with so many old and new friends over the past month at various events – and I’m continuously inspired by the wonder and enthusiasm for nature within each person. 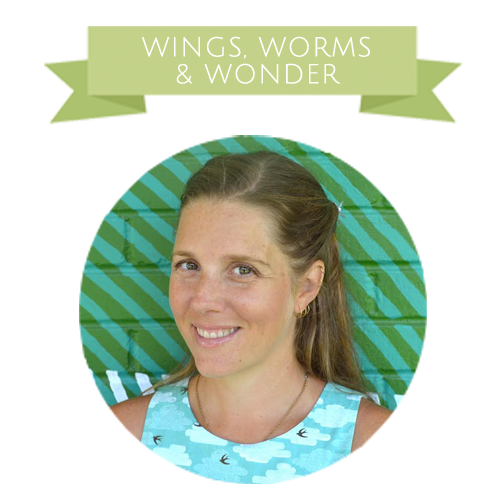 All I can say is, share your wonder. Spread it like wildfire. Let it burn out ideas and attitudes that no longer serve the good of the whole; let the new grow! Little seeds grow big trees. 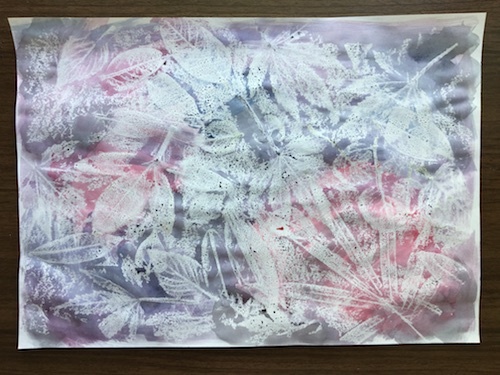 This month, we’re putting all the transitioning, changing, and falling away leaves to creative use in a resist painting project. I’ve seen this one floating around the internet recently, but I liked it so much I wanted to create my own take on it for you. Go into the world with wonder as your guide. Grab some friends, big and small, and let nature’s leaf paintings inspire your leafy creative fun! Paper – drawing or art paper works best. Watercolor paper is too thick to get good rubbings. If you are doing this in a classroom or homeschool setting, you may want to prepare trays or baskets for the fresh leaves and bowls for the leaves after they have been rubbed to keep things organized. Gather an assortment of fallen leaves on a nature walk. The very dry brittle ones won’t make rubbings as well, but will make interesting textures of their own as they crack. Red, orange, yellow, and green leaves make more detailed rubbings. Arrange your leaves onto a hard surface. You can drop them randomly or arrange them specifically. Once the leaves are set, I recommend going through and flipping them each over so the underside is facing up. 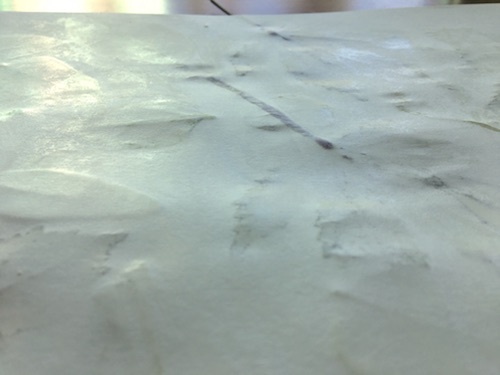 The veins are more defined on the underside which helps to get more clear and interesting rubbings. As you create a composition, consider what you want the final image to look like – like an abstract overlapping pattern as I made, or more of a clear image of each leaf laid out on the page. 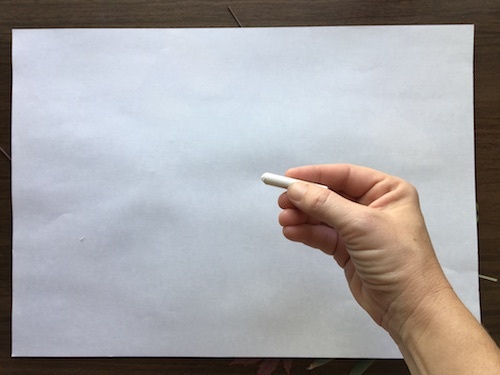 Use your white crayon to rub over the paper. Consider this – the paint will resist wherever there the waxy crayon is on the page. So, you may want to rub all over and take your chances like I did, or you may want to rub over each leaf more specifically to leave more un colored paper in between the leaf rubbings. 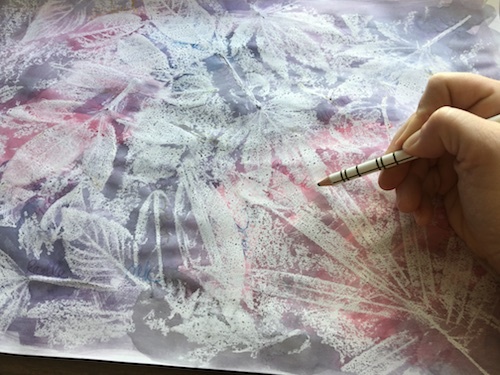 Once you make your rubbing, start painting washes of watercolor paint overtop of the paper. Since the paper is drawing or art paper and not watercolor paper, the brush shouldn’t be too soppy wet. You can create color fields, or just let the paint mix around your palette and page however chance has it. This is what I did. Layer your paint. 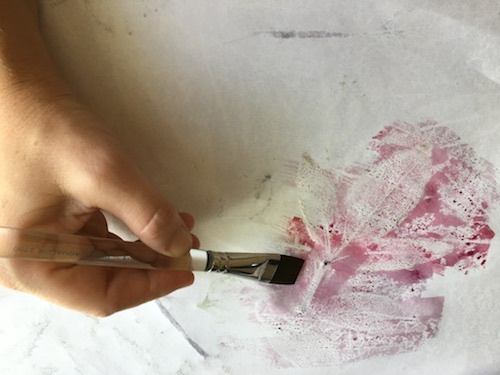 Because the washes aren’t very wet, they will dry fairly quickly so you can add layers of colors in areas to define and highlight various leafy rubbings you especially like. Let the painting dry, and if you want, go back in and add more layers of paint and colors to deepen areas of color and to highlight sections. Once the page is dry, you can add a layer of the leaves’ names with color pencil or watercolor pencil. I did this very subtly to just add a bit of depth and interest in a 3rd layer, and as a wink to the way traditional botanical illustrations are labelled. Use a field guide to learn about the leaves if you aren’t sure the names of the leaves. Once the page is dry (or damp if using watercolor pencils), you can add a layer of the leaves’ names with color pencil or watercolor pencil. I did this very subtly to just add a bit of depth and interest in a 3rd layer, and as a wink to the way traditional botanical illustrations are labelled. 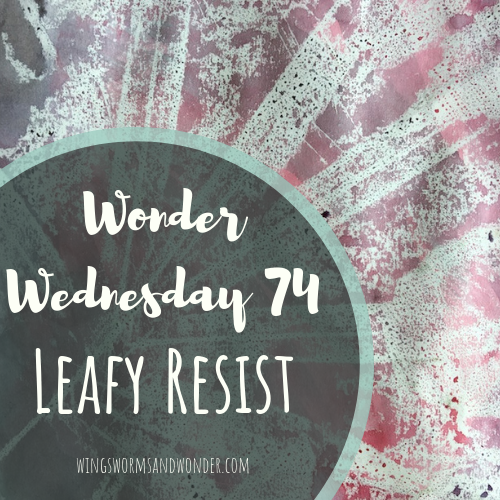 Finally, turn your leafy resist into anything you like! Scan it in and print it onto about anything you like! What ideas does this project sprout in your imagination? 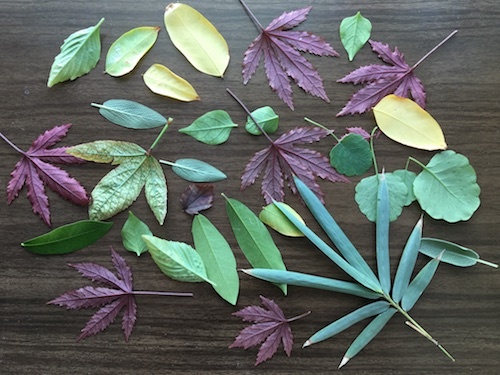 Want more leafy nature art fun? Learn to paint beautiful blendy fall leaves and more in my online class Draw Yourself Back to Nature! 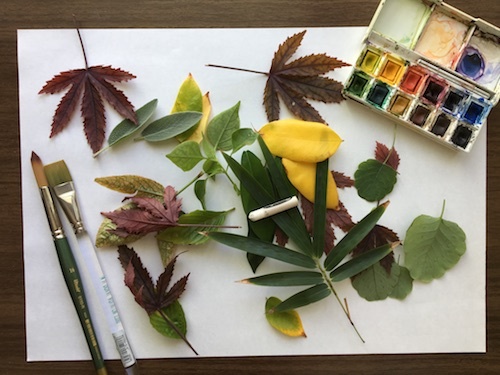 This 4 module class will teach you how to use watercolor paint and drawing to connect to the beauties and wonders of nature right outside your door – at your own pace and in your own environment. It comes with written and step by step video lessons, technique warm ups, the 4 main projects, bonus activities, inspirations resources, a private online community, and more! This year I’m participating in the Art Bundle for good! 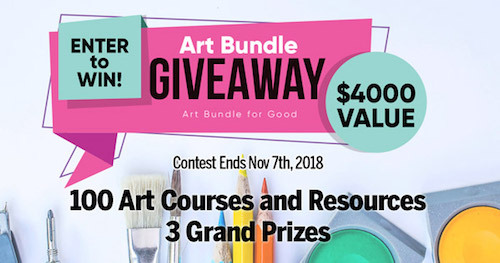 3 lucky winners will have a chance to win the entire Art Bundle for Good #3 including $4000 of art related courses, workbooks and other great resources – including 2 of my online classes! It’s free to enter the giveaway, but only lasts for 7 days, starting tomorrow Nov. 1, 2018! The best part is that 25% of the profits are going to support Courageous Kitchen, a Bangkok based charity helping refugees. The Art Bundle for Good is a great opportunity to get 100 top art learning resources from many of the biggest names in the industry and do some good at the same time!